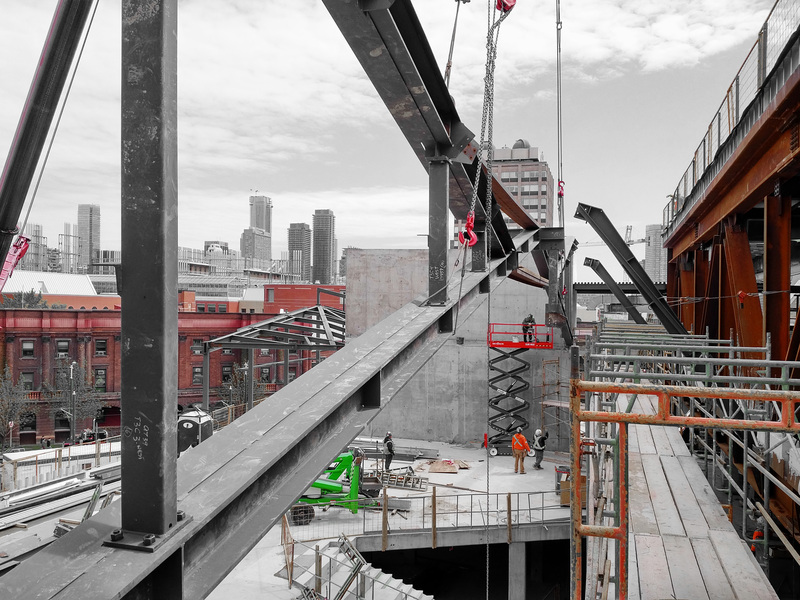 Installation of structural steel is nearly complete at the University of Toronto Daniels Faculty of Architecture, Landscape + Design. 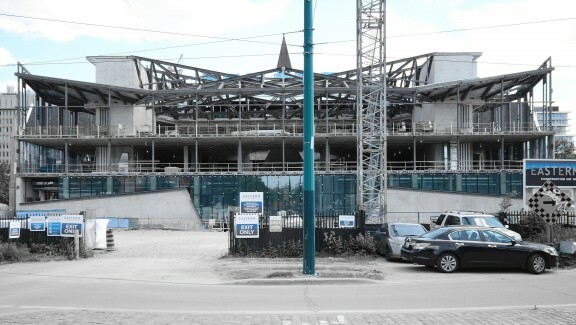 The addition to the heritage building at 1 Spadina Crescent is primarily a concrete structure, except for its steel-framed roof and mechanical penthouse. The roof is a signature architectural feature of the project: it spans over 110 feet (34m) between two service cores, across a column-less hall that will house the Faculty’s graduate design studios when the building opens later this year. 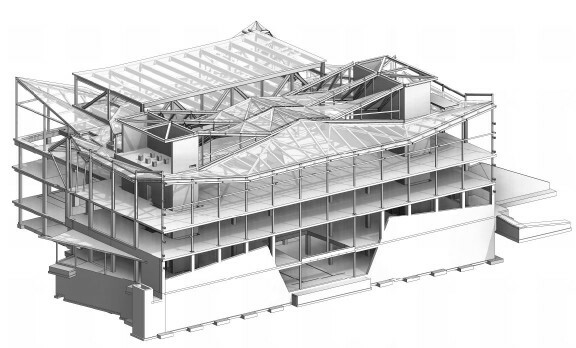 A series of 3 cantilever trusses form the geometry for a modified “sawtooth,” composed of clerestory windows that will admit high-quality northern light into the studios below. 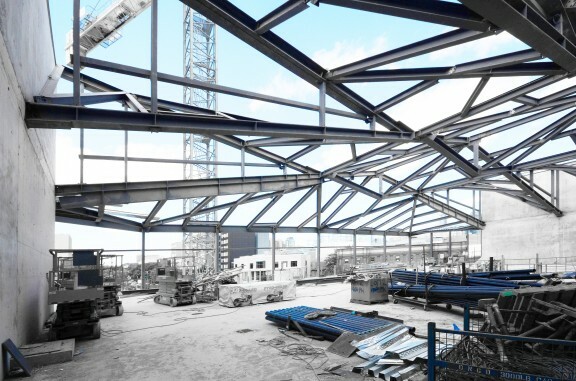 The roof will eventually support a ceiling composed of gypsum board, forming a subtle ruled surface between the clerestories as the steel members angle upwards toward the roof’s “spine”. The “spine” follows the central axis of the building, which shares a significant urban alignment with Spadina Avenue and the adjacent heritage building. The bow-tie configuration of the steel trusses allow for 3 discrete clerestory windows. The two larger windows are oriented north, however, the smaller keystone apertures along the central “spine” face south and filter direct sun with a honeycomb glazing insert. The trusses themselves do not comprise a true span, in fact, they are 3 distinct structural components: two cantilevers and a link beam. As such, the trusses function like a cantilever bridge such as the Forth Bridge in Scotland (see also illustration below), or the Confederation Bridge which connects New Brunswick with Prince Edward Island. 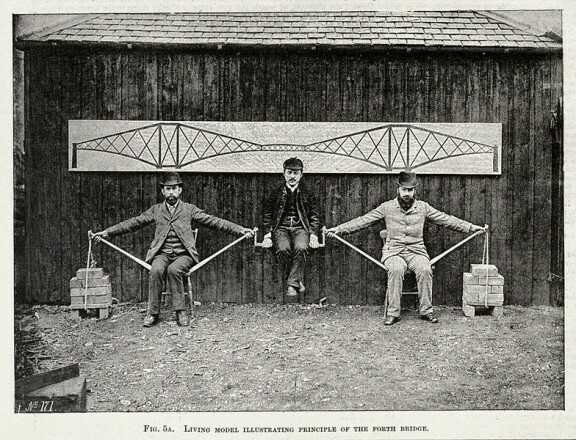 Cantilever bridges are characterized by greater structural depth aligned with the vertical supports, tapering to thin cantilevers at opposite ends between two adjacent spans. These twin cantilevers establish an equilibrium about the vertical support, balancing equal and opposite overturning forces. At the Daniels, however, there is only a single span. This means that the vertical supports — the service cores — must function to anchor the bridge both vertically and laterally. 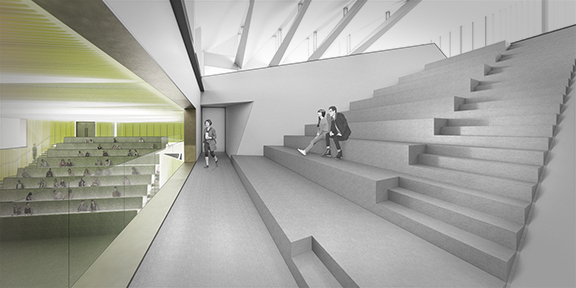 In order to resist the overturning moment of the cantilever, the design of the cores themselves must be assymetric, analogous to a contrapposto to establish counter-balance. This is accomplished by a deeper footing below the core walls, configuration of reinforcing bar, as well as the use of the concrete floor diaphragms below to brace against the cores. 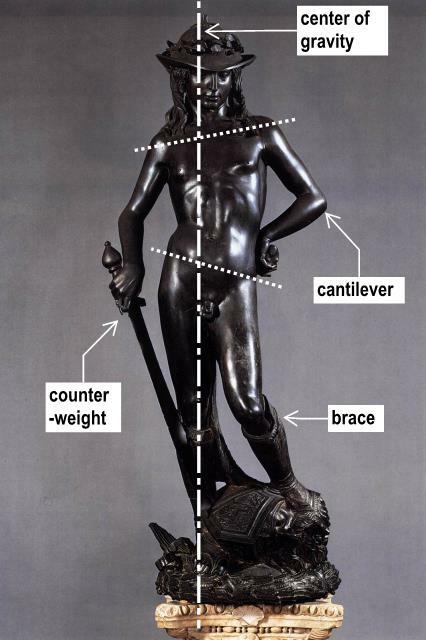 Above Left: Donatello’s David, in contrapposto — analogous to service core design supporting the roof cantilevers. 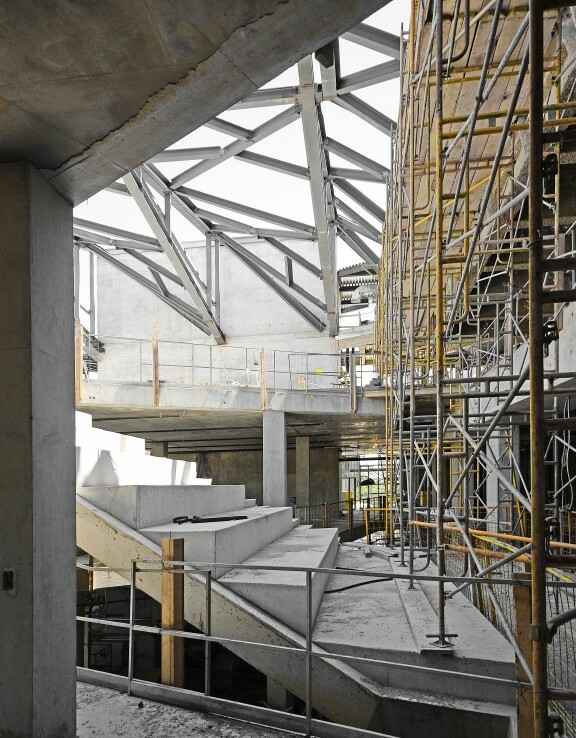 Above: Construction webcam view of the Daniels Faculty Addition, looking south. 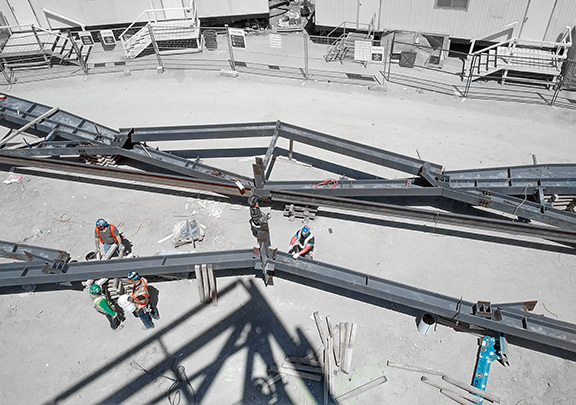 Snapshot taken during crane pick of truss #2. (Click the image for a live view).